A black and white negative of a photograph of John Sawdon driving the Merryweather on Brock Street. This photograph looks west along Dunlop Street. 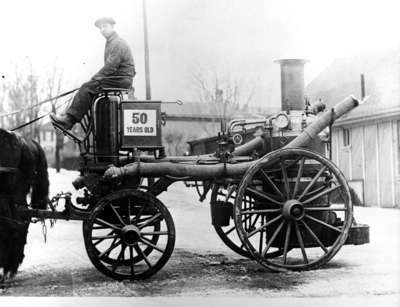 There is a sign on the steam fire engine that reads: "50 years old". The building at right is Sawdon's Fuels located at 244 Brock Street South. The Merryweather Steam Fire Engine, manufactured in England, served the Town of Whitby from November 1872 to 1926 when it was replaced by two motorized fire trucks. The engine saved downtown Oshawa from destruction by fire on the night of December 8, 1872. In 1934 the Town of Whitby gave the fire engine to the York Pioneer and Historical Society in Toronto and it was returned to the Town of Whitby in 2005. It now sits in the lobby of the Whitby Public Library Central branch. Merryweather Steam Fire Engine at Whitby, March 26, 1934, Robert Holden. Whitby Archives 08-005-003.